More users? - no matter if you are at home or at work, you certainly want to keep your privacy and probably to have your own settings than the other users have. The most convenient way of how to achieve this is to create an access account for each user. User account - is created by the administrator of the computer or the network. Each account is identified by the user name and also by a password if set up. It is also possible to set up permissions. After starting Windows, each user enters or choose his/her name, enters the password and if everything is correct the user is allowed to access the computer. At the first start, the default Windows setup is loaded. If this setup does not satisfy the user, he/she can modify it as he/she likes. These changes will be saved and added to the appropriate user profile and will be loaded at the next log in. (Basic information you will find in the Notes to user profiles article). 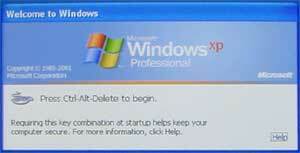 After you start Windows XP, a welcome screen is displayed - here just click on the appropriate icon or the user name and enter password and you will be allowed to access the computer. In short, this login process can be described as user authentication, permission setup and verification, use of the user profile. New welcome screen for easy user selection. This welcome screen was missing in previous Windows and you will also hardly find it on large networks which require high computer security. But for home use and for small networks it has a great attraction. You just choose a user and you can use the computer (Default setup is not to use passwords. If you activate using passwords and you set up it when creating an account, there appear a field for the password to be entered at the beginning). After you finish working on the computer, you can turn it off or just to log out and let another user to log in. It used to be always so that only one user could work on the computer. Closing programs and reopening them upon new login was very unpleasant. But this is not necessary. Go to Start menu and use the Log out user command to log out. By confirming Log out in the next dialog window you will confirm that you have finished working and the system will properly close all programs and applications running under currently logged in user name. After you log out the welcome screen is displayed. Log out is not always necessary, it is rather undesirable. For instance, some users may not like the log out confirmation. There is a reason. When logging out, you can choose to log in as another user or just to switch to another user - option enabling to use the fast-user switching function. There can be several users logged in at the same time and so they can utilize the computer much effectively without frequent logging in and out. The computer can only be used by one user at the moment, but the other ones do not have to close programs and let them run in the background (computations, downloading files from Internet and other activities), after the user comes back to the computer he/she can start working immediately without reopening and restarting programs. By switching you will jump to the welcome screen and you will be enabled to log in as another user or just to switch users. (Fast switch without using the Start menu you can also carry out by using the combination of the Windows + L keys). This function cannot be used in domain and when you are using the classical login dialog. The function can be deactivated through account administration. If there are several users logged in, the computer performance can decrease a lot (use the task manager to get overview of users and system elements utilization). If there work several users on one document, the changes of one of them can be rewritten by the other one. The applications of the MS Office pack forewarn you that you are opening a document from another user and that there are being done some changes on the document. Another user can only open and read the document and is not allowed to change it and so delete the work of the other user. Other programs (e. g. WordPad) open the document and you can make changes on it and save it. Who saves the changes of a concurrently opened document wins - his/her changes will be saved. A document saved by another user of this concurrently opened document will be rewritten by your version. So if you worry that your work can be spoiled by another user, and it is understandable, do not rather use the fast switching. It is recommended that you do not use the fast-user switching on low-performance computer with a low-powerful processor and low RAM. And the same is recommended if you do not want other users to rewrite your work. 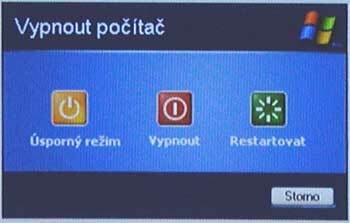 If you have finished working on the computer and you want to turn it off, you can choose from different ways of closing Windows and turning off computer. Before you close Windows there should be no other user logged in. If there will be some users logged in, their work if not saved will be lost. Options for computer turn off you will find in the Start menu - Computer shutdown or by pressing Alt + F4 keys on the desktop. Power save mode / Sleep mode - (see article Power management) - If the support for the both modes is activated, only one icon for the both functions will be displayed. Switching the icon can be done by pressing the Shift key. Shutdown - closes Windows and turns off the computer (ATX computers). On older computers and on computers where the power management mode is not set up the screen with manual turn off dialog will be displayed. On most new computers you can close Windows and turn off the computer by pressing the Power on/off button. So you will give the command to close both - Windows and computer. In older computers, by pressing this button you will immediately stop the power supply and all data will be lost and also the system can get damaged. (In the power management settings you can set up what should happen after you press the Power on/off button). Restart - executes so-called warm system start - closes Windows and restarts computer without real physical turn off. 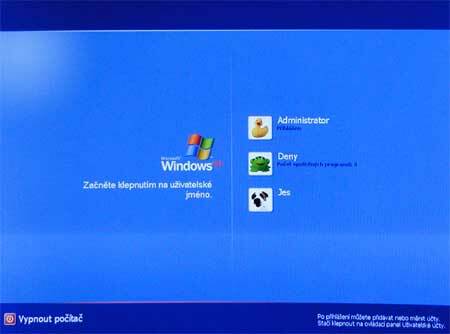 The classical login dialog known from Windows 2000 has not disappeared. It is still used upon login to domain, for computers requiring more secure login and for computers with the fast login function switched off. choose the domain or just to log in to computer after pressing the Options<< button. 2. A screen requiring the Ctrl+Alt+Del key press - before you access the login dialog, you will be asked to press the CTRL+ALT+DELETE keys. This is here to ensure more secure login, preventing from starting programs such as Trojan horse which enables unauthorized access to the system. Change of the welcome screen to the classical login dialog (Log On to Windows) you can make in the User accounts control panel where you can change the login method - The Change the user login and logout method option. Here you will find and choose: 1. only to disable the fast user login. 2. to disable the fast switching function and to disable using the welcome screen. So the classical login dialog will be activated. In the User accounts panel you can activate or deactivate the requirement for secure login by pressing the combination Ctrl+Alt+Del - in the Start menu \ Run execute the control userpasswords2 command - there will appear a dialog window - choose the Advanced panel and check the CTL+ALT+DELETE requirement for login option. On the Users panel in the previous windows you can choose running computer without login. This is convenient for computers where neither security nor using personal settings for more users are required. If you want to use automatic login with the classical login windows or you want to log in to domain, you have to edit registry. The default setup is login by choosing user. It is recommended that each user has a password. Then a password will be required for login. If you forget your password, the question mark icon will help you. This icon will not be present if you have not defined a question to remember you the password. This question is edited upon account establishing or account administration. The task manager gives you some information about user switching and an overview of activities of particular user. Currently working user is marked as active and the other logged in users are marked with Disconnected. On the Processes panel you can get an overview of running applications under particular users. The Users panel is very important. For common users, there are the Disconnect and Log out options available. The administrators also have the Send message and Connect options. This panel is only available if the fast-user switching function is activated. Log out - The same as the Log out button displayed after the log out command from the Start menu. All programs will be closed. Send message... - enables to leave a message for another logged-in user.